"Advance" presents wines from "Bodegas Francisco Casas" de Toro in London. 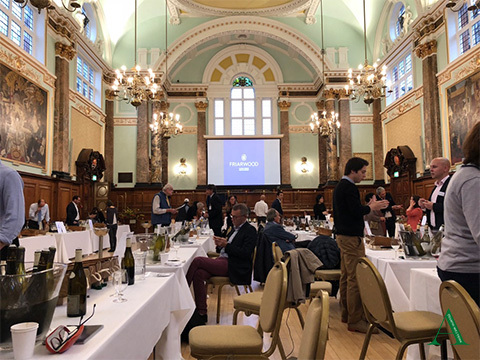 On October 15th, Advance Trading Solutions presented for the second consecutive year the wines of the winery "Francisco Casas" in "Friarwood Fine Wines Portfolio Tasting 2018", held at the Chelsea Old Town Hall in London. After the success of the first presentation of "Friarwood Fine Wines Portfolio Tasting" in 2017, it was reopened this year at the premises of the "Chelsea Old Town Hall" in London, where all the suppliers of "Friarwood Wines" came from Spain, France, Italy and Portugal. We present the new vintages of the young wines of the brands "Albus" and "Novum", a white of the Malvasia grape variety and a red grape variety of Tinta de Toro (Tempranillo). In addition to the new reserves of the brand "Camparron", the new "Viña Abba" was presented, which was the most successful. During the presentation of this year all attendance records were broken. In the morning and until five in the afternoon, the entrance was only allowed for accredited professionals. Customers from restaurants, hotels, catering, specialty stores, sommeliers, etc. After five in the afternoon, the doors were opened for the general public. This initiative was tremendously successful, since the private audience could taste the entire portfolio of Friarwood wines and even buy those wines that somehow made him fall in love. Many thanks to the entire team of "FRIARWOOD" for the excellent organization and above all for its great human value and treatment of suppliers.